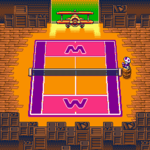 This article is about the game Mario Tennis for the Game Boy Color. 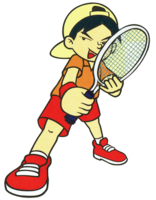 For the Nintendo 64 game of the same name, see Mario Tennis (Nintendo 64). 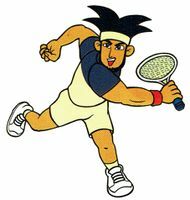 For the series as a whole, see Mario Tennis (series). 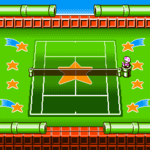 Mario Tennis, known in Japan as Mario Tennis GB (マリオテニスGB), is a tennis game for the Game Boy Color. 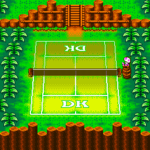 It is the second direct Mario Tennis game in the series, and the first handheld game in the series. The game features an RPG-like story mode, in which the player controls either Alex or Nina in a quest to become the top tennis player and beat the best player of all, Mario. It was re-released on the 3DS Virtual Console. / - Hit the ball in a very weak manner. + - Topspin Shot, a red, powerful, high bouncing shot. + - Slice Shot, a blue, defensive shot with side spin and a low trajectory. + - Smash, the most powerful shot, clad in purple. → - Lob Shot, a high shot that aims for the back of the court with very high bounce. → - Drop Shot, a low, weak shot that barely glazes over the net with little bounce. Mario Tennis has several different modes. The modes are Mario Tour, Exhibition, Linked Play, and Mario Minigames. In Mario Tour, the player takes control of Alex or Nina. They are the new students trying to make their way up the ranks at the Royal Academy, a school for tennis. 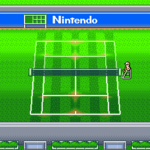 At the beginning of the game, the player gets to choose whether they are going to play singles or doubles matches, and can change between either whenever they want. The player's partner can be either Harry or Kate. In Mario Tour, the player's character does exercises with coaches and plays against higher ranked players in order to get a higher rank for him or herself. Higher ranks mean they can challenge better players. Eventually, they can get a high enough rank to enter the Island Open. After the Island Open the player can face Mario in singles on the Castle Court; in doubles, both Mario and Peach. As the player progresses through the ranks, the player gets to increase their characters ability in different areas (similar to an RPG). 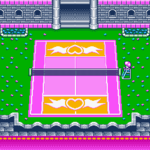 In this mode, the player plays a single game of tennis. The player may choose what character both they and the computer uses as well as the court and computer's difficulty level. Both singles and doubles are available in Exhibition. Linked Play is just like Exhibition Mode, except that the player plays against another human player instead of a computer. Linked Play requires two Game Boy Colors, two copies of Mario Tennis for the GBC, and a link cable. This mode was removed from the 3DS Virtual Console release due to multiplayer support being removed. Boo Blast Mario This minigame sees Mario rallying a ball with Luigi, trying to hit Boos that hover above the net. The score doubles with each hit for a maximum of 128 points per hit. Shooting Stars Luigi This game involves playing as Luigi to smash stars. More points are collected for each consecutive hit. Target Shot Baby Mario In this game, Baby Mario must hit the ball into the targeted area. Hitting the appropriate shot will deliver more points. Banana Bunch Donkey Kong Donkey Kong must bounce a ball on a wall with Banana panels on it. The panels give out points based on the amount of Bananas on it. 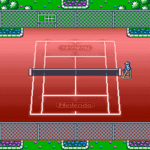 With a copy of Mario Tennis for the Nintendo 64, a Nintendo 64, a Transfer Pak, and a copy of Mario Tennis for the GBC, it is possible to transfer information between the two versions of the game. Characters from the Game Boy Color game can be transferred to the Nintendo 64 game and vice-versa. All characters have different statistics, making each of them unique. Most characters need to be unlocked by beating them in the Mario Tour. Some Mario characters need to be unlocked by a N64 Transfer Pak. The N64 Transfer Pak characters are not usable in the 3DS version. Below is a full list of all of the characters in the game. The nine Mario characters were taken from the N64 version while six playable characters need to be unlocked. These characters must be created before they are usable. Star Court Fast Strong Mario World Have everything marked with a star on the Clear Status menu. Warehouse Court Slow Strong Mario World Beat every Mario character in exhibition with a Mario character. This court is not unlockable on Virtual Console since this requires characters transferred from the N64 version with the Transfer Pak. Nintendo 3DS Tim Latshaw, Nintendo Life 8/10 "Some may call fault with Mario Tennis’s stripped multiplayer functionality and chopped roster, but those who never knew what was possible to be unlocked in the original version might never even realize the possibilities are missing. Mario Tennis still provides an amazingly tight and fun portable experience with a skillful shot system and an engaging RPG-like motif. So what if Mario doesn’t register as much? He’ll just have to make do with golf, baseball, football, every Olympic sport." 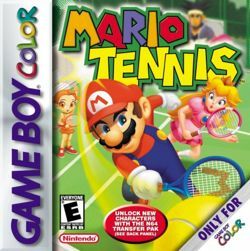 Game Boy Color Frank Provo, GameSpot 8.2/10 "There is no doubt going to be a minor debate over which of the two games, Mario Tennis or Virtua Tennis, is better. Thanks to quality gameplay and Nintendo's rich stable of character designs, Mario Tennis goes toe-to-toe with Sega's game in every conceivable way. To discuss which is better is a moot point. Nintendo comes at you with familiar faces and more unique modes, while Sega's game counters with real tennis pros and slightly more accurate gameplay. Don't let its happy looks and age-appropriate gameplay fool you. Mario Tennis hits hard and fast.'" 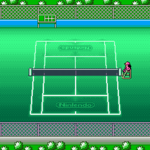 For this subject's image gallery, see Gallery:Mario Tennis (Game Boy Color). Daisy's appearance at Peach's side. Daisy, Boo, and Toad make supporting appearances at Peach's Castle. They are not playable, however. Yoshi, Bowser, Wario, and Waluigi are unlockable by linking the game up to the N64 version of Mario Tennis using a Transfer Pak. Bowser, Wario, Waluigi, and Luigi are unlockable in the same method in Mario Golf: Advance Tour by linking with Mario Golf: Toadstool Tour. Despite being the title character, Mario can only be played as after completing the Mario Tour. 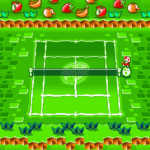 This makes the Game Boy Color version of Mario Tennis the only game in the Mario franchise where Baby Mario is a starting character while Mario is unlockable. This is Waluigi's only appearance in a GB/GBC game. 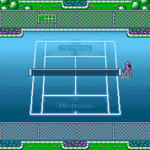 Characters and courts in this game, along with Mario Tennis on the Nintendo 64 can no longer be transferred while playing the Virtual Console release, as the Nintendo 3DS is not compatible with the Nintendo 64/Game Boy Color Transfer Pak. This page was last edited on April 4, 2019, at 19:29.